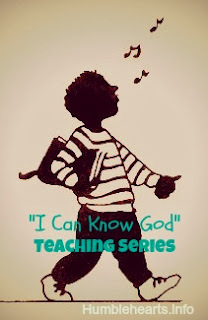 This is the third teaching in a series of 5 teachings to help teach young children about God. The target audiences are toddlers, preschoolers and young elementary; with plenty of room for you to adjust to the needs of your child. I have taught this to my preschooler and toddler. If I was just teaching it to my toddler I would have simplified it a little more. I wrote this in a way to give ideas of how to talk when teaching children the Bible. Going through the verses on your own first (as listed in the "Parent Preparation") is extremely helpful in teaching young children accurately. "My God is So Great", Video, This version adds another verse. The mountains are His, the rivers are His, the stars are His handiwork too. My God is so great, so strong and so mighty, there's nothing my God cannot do, for you! List of God's names (print from here), Copy of this teaching, something heavy (such as a 20 pound weight), a picture of Abraham, picture of Moses crossing the Red Sea, and a picture of an empty tomb (these can be from a children’s Bible or coloring book). Since I am an adult I am stronger than you. Do you know who is stronger than me? God! He is stronger than any person. God has many names (show them the sheet of God’s names) God, Lord-Jehovah, Holy Spirit, the Creator. Almighty means “most powerful”. Our God is the most powerful. (Read Jeremiah 32:17) Nothing is too hard for God! There are things that are hard for us to do, but nothing is too hard for God. When we pray to God and ask for help, nothing is too hard for Him! God is looking to help us and be strong for us. He wants us to go to Him for help. God showed His strength when He raised Jesus Christ from the dead. Jesus Christ died for our sins. God is so strong that He raised Jesus from the dead and made him alive! (show picture of the empty tomb). Praise God: Read Psalm 21:13b “We will sing and praise Your power.” Sing songs together that praise God. Play children's instruments together such as shakers, a child's piano, or a guitar, as you praise God together. Cross the Red Sea: Act out crossing the Red Sea. Drape blankets on chairs to be the water parting. Walk through on the dry ground.